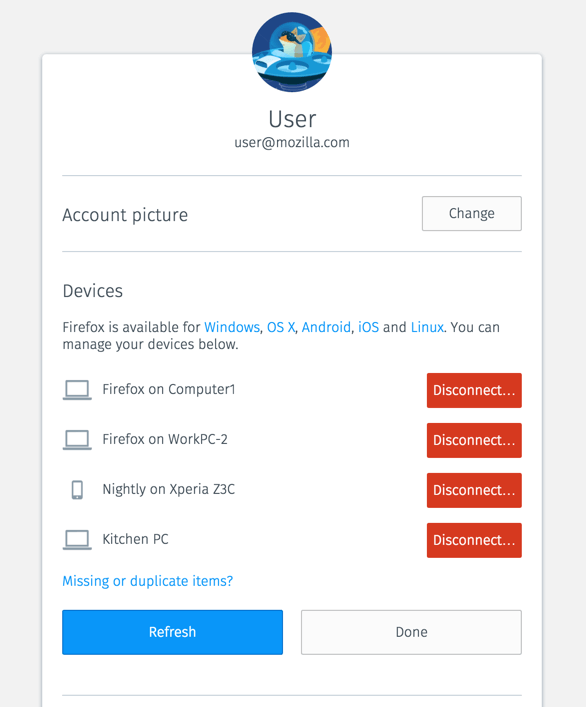 Today we are beginning a phased roll out of a new account management feature to Firefox Accounts users. This new feature aims to give users a clear overview of all services attached to the account, and provide our users with full control over their synced devices. With the new “Devices” panel in your Firefox Accounts settings, you will be able to manage all your devices that use Firefox Sync. 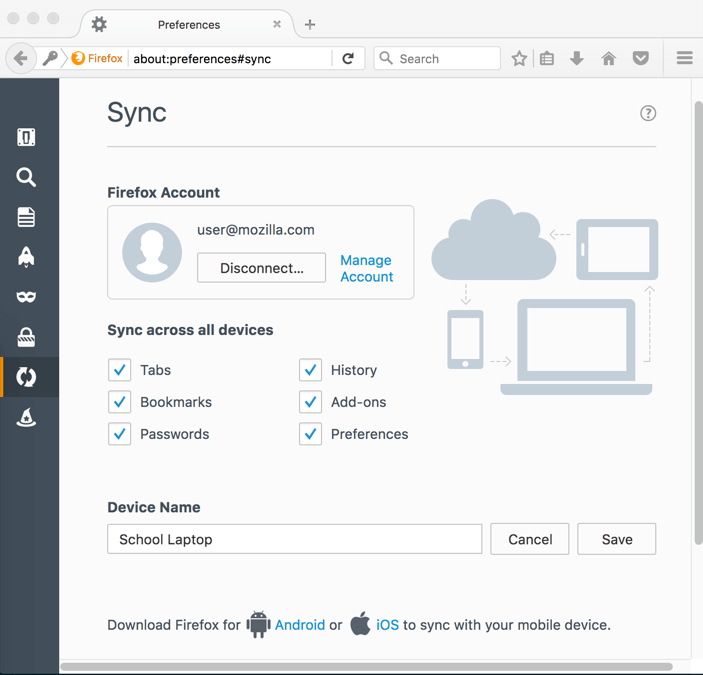 The devices section shows all connected Firefox clients on Desktop, iOS and Android, making it an excellent addition to those who use Firefox Sync on multiple devices. Use the “Disconnect” button to get rid of the devices that you don’t want to sync. Thanks to everyone who worked on this feature: Phil Booth, Jon Buckley, Vijay Budhram, Alex Davis, Ryan Feeley, Vlad Filippov, Mark Hammond, Ryan Kelly , Sean McArthur, John Morrison, Edouard Oger, Shane Tomlinson. Special thanks to developers on the mobile teams that helped with device registration: Nick Alexander, Michael Comella, Stephan Leroux and Brian Nicholson. If you want to get involved with the Firefox Accounts open source project please visit: fxa.readthedocs.io. Make sure to visit the Firefox Accounts settings page in the coming weeks to take more control over your devices! Can’t wait. Looks fun to try out, at least. Be nice to have the ability to change the email address registered to the Sync – Firefox Account. Any word about how long before that is possible? Thanks for the feature suggestion. I’ll make sure it’s added in to the Sync team’s feature backlog.